The first Broadway revival in nearly 50 years of the musical comedy masterpiece by composer Cole Porter and authors Sam and Bella Spewack not only enchanted critics and delighted audiences, but also went on to triumph as one of the biggest prize-winners of the 2000 season. Taking its inspiration from Shakespeare, “Kiss Me, Kate” recounts the backstage and onstage antics of two feuding romantic couples during a touring production of “The Taming of the Shrew.” Sparkling with 18 classic Cole Porter songs — including “Another Op’nin’, Another Show,” “Wunderbar,” “So in Love,” “Always True to You in My Fashion,” “Too Darn Hot,” and “Brush Up Your Shakespeare” — “Kiss Me, Kate” epitomizes the Broadway musical comedy at its irresistible best. Directed by Michael Blakemore, this 2000 Tony-winner for Best Revival stars Brent Barrett, Rachel York, Nancy Anderson, and Michael Berresse as the bickering couples whose offstage disputes ultimately entangle them with a pair of unexpectedly erudite gangsters and a megalomaniacal U.S. Army general. Cole Porter’s most successful musical, the original production of “Kiss Me, Kate” opened on Broadway at the New Century Theatre on December 30, 1948 and ran for 1,077 performances. It garnered five Tony Awards in 1949, the same number the revival claimed in 2000. Learn more about the revival, which was taped during its run at London’s Victoria Palace Theatre, and its celebrated director, Michael Blakemore, in an essay by writer Michael Coveney. Read an extensive biography of Cole Porter as well as many other American composers and songwriters whose music is featured this season on GREAT PERFORMANCES in the Encyclopedia of Composers & Songwriters; browse the Q&A with Professor Thomas Hischak, author of numerous books on American film and stage musicals, in Ask the Expert; and watch extended video excerpts from the program in the Video Jukebox. Lastly, see the complete list of songs and photos from the production in the “Kiss Me, Kate” Slideshow. Special funding for this program was provided by the LuEsther T. Mertz Charitable Trust and the Irene Diamond Fund. 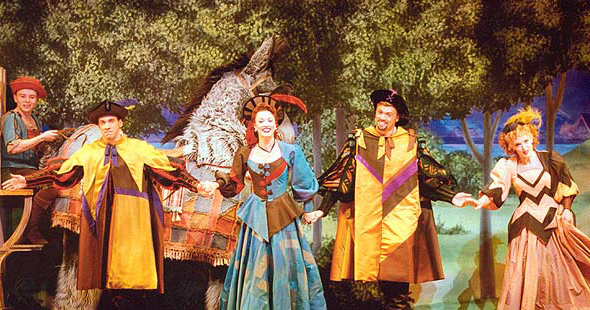 The “KISS ME, KATE” DVD can be purchased from Shop Thirteen.